Recipes from a small kitchen in London and now Bangkok. Continuing my thread of recipes using up what I've got in my cupboards before I move house is this delicious salad. It's straightforward to prepare and very 'Ottolenghi' in style. I had a jar of wonderful Spanish chickpeas to use that I had bought from Brindisa that are seriously good. Much creamier and quite a lot larger than what you usually get in cans. This recipe brings together several of my favourite ingredients into a tasty and satisfying salad. If you don't like one of the ingredients don't use it - make it vegan by omitting the tuna and egg, maybe add some grilled red peppers for a different flavour, boost the chilli levels, switch the herbs - basically, go with what you fancy, this is your salad. It makes a great summer supper especially if you serve it with some toasted fresh bread. Preheat the oven to 200C, quarter the tomatoes and lightly drizzle with olive oil, sprinkle with salt and a generous amount of cracked black pepper. Roast in the oven for around 30 minutes or until they are soft and slightly golden on the edges. Meanwhile prepare the rest of the salad. Preheat a griddle pan then slice the courgettes lengthways about 3-5mm thick, brush with a little olive oil mixed with black pepper then place the slices on the griddle pan for about 5 minutes on each side or until they are cooked through and have grill marks on each side. Place to the side until you're ready to assemble the dish. Boil the eggs to your preferred hardness. I like them when the yolk is still a bit soft for salads. Peel and halve ready for assembly. 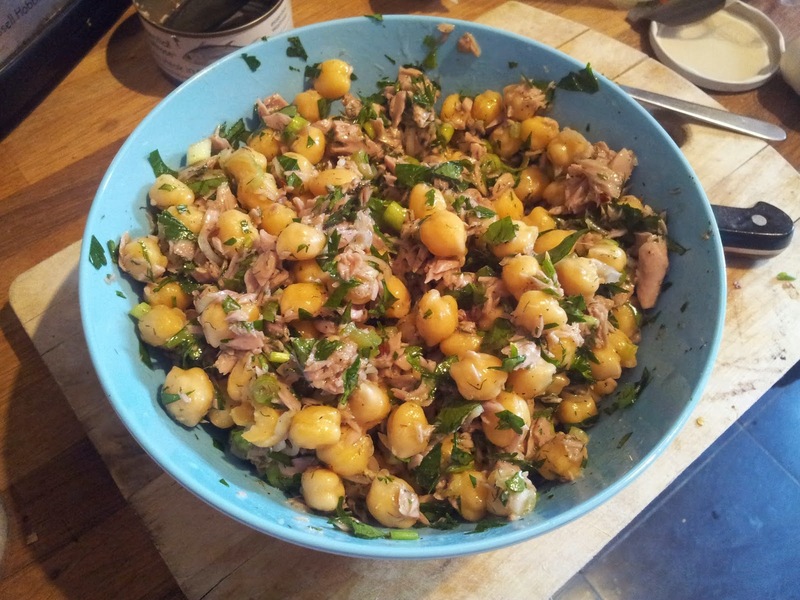 In a large bowl place the chickpeas, tuna, chopped spring onions, chilli flakes, sumac, parsley, dill, a little salt and pepper to taste and a glug each of olive oil and sherry vinegar. Mix together until evenly combined. Taste, then adjust the olive oil, vinegar, salt and pepper balance to your preference. 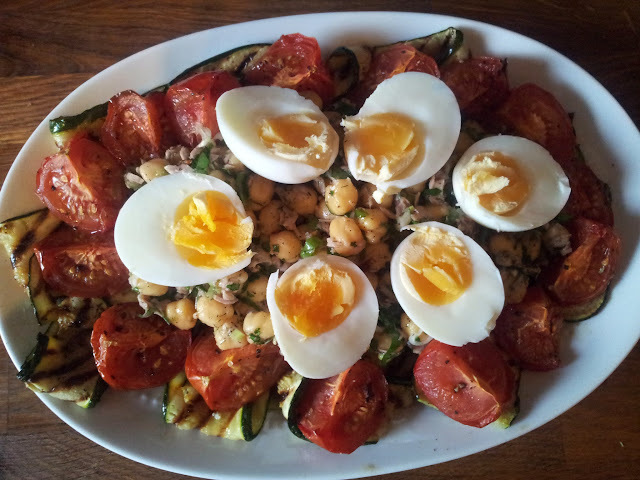 You can put this salad together any way you like I opted for a ring of courgettes round the edge of the plate topped with the roasted tomatoes. 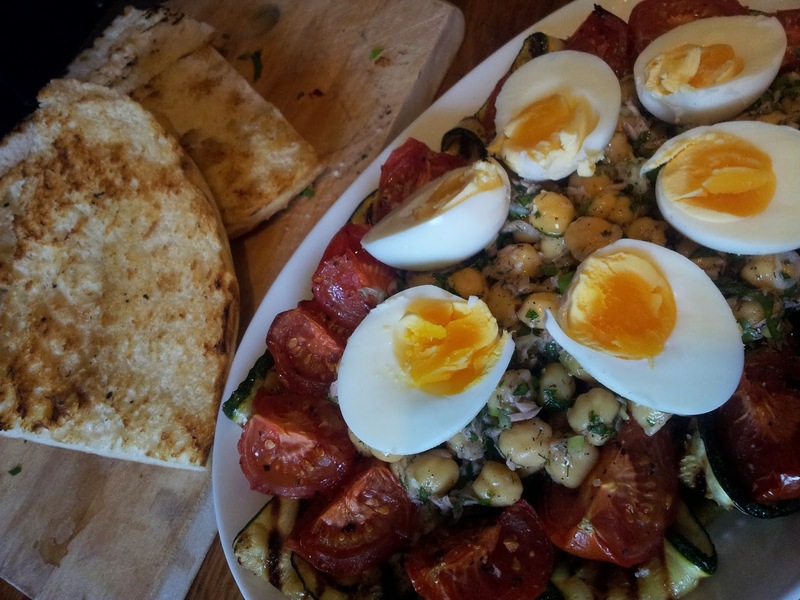 The chickpea mixture in the middle and the boiled egg halves on top. A final sprinkle of sumac over the top and it's ready to go. I'm entering this recipe in the July Four Seasons Food Challenge hosted by the lovely people at Chez Foti and Delicieux. What a salad! Shall be adding that to my Awesome Salads Pinterest board for sure! 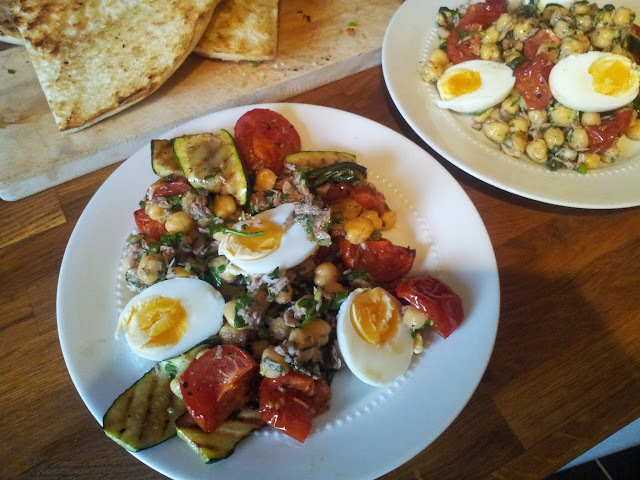 I do love chick peas in a salad and love your combination of tuna, eggs and courgettes with them and all flavoured with Sumac, Sherry Vinegar, dill and chilli. Must be heavenly, and just shows what wonders can be made with cupboard emptying operations! Thanks so much for entering it to the Four Seasons Food challenge, would be a fab barbie side. Wow - that looks completely awesome! I would love to eat it!! It is so colourful and inviting, a perfect Summer feast of a salad. Love the sprinkly of sumac in there too. Thanks for entering FSF! 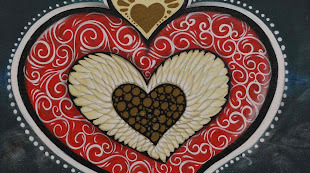 A London girl with a mixed up cultural heritage of Polish, Latvian and English and an obsession with music and food. My recipes are inspired by childhood, travels and the food that is all around me in London.